The Grumman A-6 Intruder was a twin jet-engine, mid-wing attack aircraft built in the United States by Grumman Aerospace. In service with the U.S. Navy and U.S. Marine Corps between 1963 and 1997, the Intruder was designed as an all-weather replacement for the piston-engined A-1 Skyraider medium attack aircraft. A specialized electronic warfare derivative, the EA-6B Prowler, remains in service as of 2010. As the A-6E was slated for retirement, its precision strike mission was taken over by the now retired F-14 Tomcat equipped with LANTIRN pod. The Intruder was developed in response to a United States Navy specification for an all-weather carrier-based attack aircraft to serve as a replacement for the piston-powered, World War II-era A-1 Skyraider. Grumman was awarded the contract in 1957, and the resulting A2F-1 made its first flight on 19 April 1960. The jet nozzles were originally designed to swivel downwards for shorter takeoffs and landings, but this feature was never incorporated in prototype or production aircraft. The cockpit uses an unusual double pane windscreen and side-by-side seating arrangement in which the pilot sits in the left seat, while the bombardier/ navigator sits to the right and below. The incorporation of an additional crew member with separate responsibilities along with a unique CRT that gives a synthetic display of terrain ahead, enabled low-level attack in all weather conditions. The wing is very efficient at subsonic speeds compared to supersonic fighters such as the F-4 Phantom II, which are also limited to subsonic speeds when carrying a payload of bombs. A very similar wing would be put on pivots on Grumman's later supersonic swing-wing F-14 Tomcat, as well as similar landing gear. The Intruder was also equipped with the "Deceleron", a type of airbrake on the wings with two panels that open in opposite directions; in this case, one panel goes up, while another goes down. Picture - An air-to-air left side view of an A-6E Intruder aircraft assigned to USS Dwight D. Eisenhower. The Intruder received a new standardized DOD designation of A-6A in the fall of 1962, and entered squadron service in February 1963. The A-6 became both the US Navy's and US Marine Corps's principal medium and all-weather/night attack aircraft from the mid-1960s through the 1990s and as an aerial tanker either in the dedicated KA-6D version or by use of a buddy store (D-704). This role was served in the USAF by the F-105 Thunderchief and later F-111 which was also later converted to a radar jammer as the EF-111 Raven. 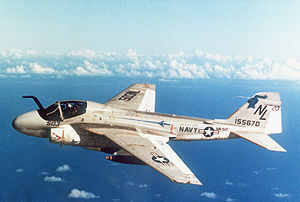 A-6 Intruders first saw action during the Vietnam War, where the craft were used extensively against targets in Vietnam. The aircraft's long range and heavy payload (18,000 lb/8,170 kg) coupled with its ability to fly in all weather made it invaluable during the war. 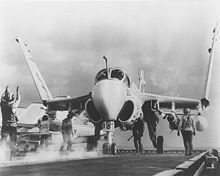 However, its typical mission profile of flying low to deliver its payload made it especially vulnerable to anti-aircraft fire, and in the eight years the Intruder was used during the Vietnam War, the U.S. Navy and U.S. Marine Corps lost a total of 84 A-6 aircraft of various series. The first loss occurred on 14 July 1965 when an Intruder from Attack Squadron 75 (VA-75) from the carrier USS Independence, flown by LT Donald Boecker and LT Donald Eaton, commenced a dive on a target near Laos. An explosion under the starboard wing damaged the starboard engine, causing the aircraft to catch fire and the hydraulics to fail. Seconds later the port engine failed, the controls froze, and the two crewmen ejected. Both crewmen survived. Picture - S-3A Viking, A-6E Intruder, and an EA-6B Prowler aircraft are parked on the flight deck of the aircraft carrier USS John F. Kennedy (CV-67) during a storm. Of the 84 Intruders lost to all causes during the war, 10 were shot down by surface to air missiles (SAMs), two were shot down by MiGs, 16 were lost to operational causes, and 56 were lost to conventional ground fire and AAA. The last Intruder to be lost during the war was from Attack Squadron 35 (VA-35), flown by LTs C. M. Graf and S. H. Hatfield, from the carrier USS America; they were shot down by ground fire on 24 January 1973 while providing close air support. The airmen ejected and were rescued by a Navy helicopter. Twenty U.S. Navy aircraft carriers rotated through the waters of Southeast Asia, providing air strikes, from the early 1960s through the early 1970s. 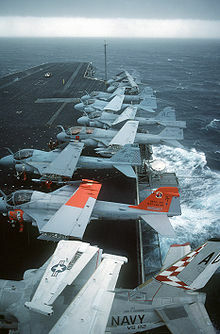 Nine of those carriers lost A-6 Intruders: USS Constellation lost 11, USS Ranger lost eight, USS Coral Sea lost six, USS Midway lost two, USS Independence lost four, USS Kitty Hawk lost 14, USS Saratoga lost three, USS Enterprise lost eight, and USS America lost two. Most U.S. Marine Corps A-6 Intruders were shore based in South Vietnam at Chu Lai and Da Nang. 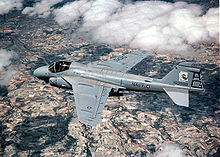 A-6 Intruders were later used in support of other operations, such as the International forces in Lebanon (1983). One Intruder and one A-7 Corsair II were downed by Syrian missiles on 4 December. Later in the 1980s, two Naval Reserve A-7 Corsair II light attack squadrons, VA-205 and VA-305, were reconstituted as medium attack squadrons with the A-6E at NAS Atlanta, Georgia and NAS Alameda, California, respectively. 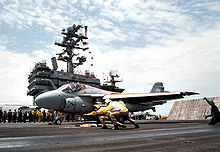 Picture - An A-6E Intruder prepares for launch aboard USS Enterprise. During Operation Desert Storm in 1991, Navy and Marine Corps A-6s flew more than 4,700 combat sorties, providing close air support, destroying enemy air defenses, attacking Iraqi naval units, and hitting strategic targets. They were also the Navy's primary strike platform for delivering laser-guided bombs. 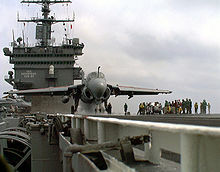 The U.S. Navy operated them from the aircraft carriers Saratoga, John F. Kennedy, Midway, Ranger, America, Nimitz, and Theodore Roosevelt, while U.S. Marine Corps A-6s operated ashore, primarily from Shaikh Isa Air Base in Bahrain. Three A-6s were shot down in combat by SAMs and AAA. Following Desert Storm, Intruders were used to patrol the no-fly zone in Iraq and provided air support for Marines during Operation Restore Hope in Somalia. The last A-6E Intruder left Marine Corps service on 28 April 1993. The A-6 also saw further duty over Bosnia in 1994. Despite the production of new airframes in the 164XXX Bureau Number (BuNo) series just before and after Operation Desert Storm, augmented by an aggressive re-winging program of older airframes, the A-6E and KA-6D were quickly phased out of service in the 1990s in a Navy cost-cutting move driven by the Office of the Secretary of Defense to reduce the number of different type/model/series (T/M/S) of aircraft in carrier air wings. The A-6 was intended to be replaced by the A-12 Avenger II, but that program was canceled due to cost overruns. The Intruder remained in service for a few more years before being retired in favor of the LANTIRN equipped F-14 Tomcat, which was in turn replaced by the F/A-18E/F Super Hornet. The last Intruders were retired on 28 February 1997. Many in the US defense establishment in general, and Naval Aviation in particular, questioned the wisdom of a shift to a shorter range carrier-based strike force compared to the older generation aircraft. However, the availability of USAF KC-135 and KC-10 tanking assets modified to accommodate USN and USMC tactical aircraft in all recent conflicts was perceived by certain senior decision makers in the Department of Defense to put a lesser premium on self-contained range. Although the Intruder could not match the F-14's or the F/A-18's speed or air-combat capability, the A-6's range and load-carrying ability are still unmatched by newer aircraft in the fleet. A number of retired A-6 airframes that were awaiting rewinging at the Northrop Grumman facility in St. Augustine, Florida were sunk off the coast of St. Johns County, Florida to form a fish haven entitled Intruder Reef. Surviving aircraft fitted with the new wings, as well as later production aircraft (i.e., BuNo 164XXX series) were stored at the AMARC storage center at Davis-Monthan Air Force Base, Arizona. This designation was given to eight prototypes and pre-production aircraft, used in the development of the A-6A Intruder, equipped with AN/APQ-88 radar. The initial version of the Intruder was built around the complex and advanced DIANE (Digital Integrated Attack/Navigation Equipment), intended to provide a high degree of bombing accuracy even at night and in poor weather. DIANE consisted of multiple radar systems: the Norden Systems AN/APQ-92 search radar replacing the AN/APQ-88 on YA-6A, and a separate AN/APG-46 for tracking, AN/APN-141 radar altimeter, and AN/APN-122 Doppler navigational radar to provide position updates to the AN/ASN-31 inertial navigation system. An air-data computer and ballistics computer integrated the radar information for the bombardier/navigator (BN) in the right-hand seat. TACAN and ADF were also provided for navigational use. When it worked, DIANE was perhaps the most capable nav/attack system of its era, giving the Intruder the ability to fly and fight in even very poor conditions (particularly important over Vietnam and Thailand during the Vietnam War). It suffered numerous teething problems, though, and it was several years before its reliability was established. Total A-6A production was 488, including six pre-production prototypes. 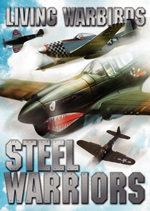 Many of the surviving aircraft were converted to other variants. To provide Navy squadrons with a defense suppression aircraft to attack enemy antiaircraft defense and SAM missile systems, a mission dubbed "Iron Hand" in Navy parlance, 19 A-6As were converted to A-6B standard from 1967 to 1970. The A-6B had many of its standard attack systems removed in favor of special equipment to detect and track enemy radar sites and to guide AGM-45 Shrike and AGM-78 Standard anti-radiation missiles, with AN/APQ-103 radar replaced earlier AN/APQ-92 in A-6A and AN/APN-153 navigational radar replaced earlier AN/APN-122 in A-6A. Five were lost in combat, and the rest were later converted to A-6E standard in the late 1970s. Picture - A KA-6D refueling a F-14A in 1987. In the early 1970s 78 A-6As and 12 A-6Es were converted for use as tanker aircraft, providing aerial refueling support to other strike aircraft. The DIANE system was removed and an internal refueling system was added, sometimes supplemented by a D-704 refueling pod on the centerline pylon. The KA-6D theoretically could be used in the day/visual bombing role, but it apparently never was, with the standard load-out being four fuel tanks. Because it was based on a tactical aircraft platform, the KA-6D provided a capability for mission tanking, the ability to keep up with strike packages and refuel them in the course of a mission. A few KA-6Ds went to sea with each Intruder squadron, and the retirement of the aircraft left a gap in USN and USMC refueling tanker capability. The USN S-3 Viking also has an aerial refueling capability, but its performance and fuel capacity effectively limit it to the role of recovery tanker. The loss of mission tanking capability was only later remedied by the new F/A-18E/F Super Hornet, which can act as a mission tanker. Picture - An A-6E Intruder flying over Spain during Exercise Matador. The definitive attack version of the Intruder, introduced in 1970, with its first deployment, 9 December 1971, with vastly upgraded navigation and attack systems. The earlier separate search and track (fire control) radars of the A-6A/B/C were replaced by a single Norden AN/APQ-148 multi-mode radar, and the onboard computers with a more sophisticated (and generally more reliable) IC based system, as opposed to the A-6A's DIANE discrete transistor-based technology. A new AN/ASN-92 inertial navigation system was added, along with the CAINS (Carrier Aircraft Intertial Navigation System), for greater navigation accuracy. Picture - Final VA-34 A-6E Intruder launch from the flight deck the USS George Washington, 1996. Beginning in 1979, all A-6Es were fitted with the AN/AAS-33 DRS (Detecting and Ranging Set), part of the "Target Recognition and Attack Multi-Sensor" (TRAM) system, a small, gyroscopically stabilized turret, mounted under the nose of the aircraft, containing a FLIR boresighted with a laser spot-tracker/designator and IBM System/4 Pi computer. TRAM was matched with a new Norden AN/APQ-156 radar. The BN could use both TRAM imagery and radar data for extremely accurate attacks, or use the TRAM sensors alone to attack without using the Intruder's radar (which might warn the target). TRAM also allowed the Intruder to autonomously designate and drop laser-guided bombs. In addition, the Intruder used AMTI (Airborne Moving Target Indicator) which allowed the aircraft to track a moving target (such as a tank or truck) and drop ordnance on him even though the target was moving. Also, the computer system allowed the use of Offset Aim Point (OAP), giving the crew the ability to drop on a target unseen on radar by noting coordinates of a known target nearby and entering the offset range and bearing to the unseen target. In the early 1990s some surviving A-6Es were upgraded under SWIP (Systems/Weapons Improvement Program) to enable them to use the latest precision-guided munitions, including AGM-65 Mavericks, AGM-84 Harpoons, AGM-84E SLAMs, AGM-62 Walleyes and the AGM-88 HARM anti-radiation missile. After a series of wing-fatigue problems, about 85% of the fleet was fitted with new graphite/epoxy/titanium/aluminum composite wings. An advanced A-6F Intruder II was proposed in the mid-1980s that would have replaced the Intruder's elderly Pratt & Whitney J52 turbojets with non-afterburning versions of the General Electric F404 turbofan used in the F/A-18 Hornet, providing substantial improvements in both power and fuel economy. The A-6F would have had totally new avionics, including a Norden AN/APQ-173 synthetic aperture radar and multi-function cockpit displays - the APQ-173 would have given the Intruder air-to-air capacity with provision for the AIM-120 AMRAAM. Two additional wing pylons were added, for a total of seven stations. Although five development aircraft were built, the Navy ultimately chose not to authorize the A-6F, preferring to concentrate on the A-12 Avenger II. This left the service in a quandary when the A-12 was cancelled in 1991. Grumman proposed a cheaper alternative in the A-6G, which had most of the A-6F's advanced electronics, but retained the existing engines. This, too, was cancelled. An electronic warfare/ECM version of the Intruder was developed early in the aircraft's life for the USMC, which needed a new ECM platform to replace its elderly F3D-2Q Skyknights. An EW version of the Intruder, initially designated A2F-1Q and subsequently redesignated EA-6A, first flew on 26 April 1963. It had a Bunker-Ramo AN/ALQ-86 ECM suite, with most electronics contained on the walnut-shaped pod atop the vertical fin. They were equipped with AN/APQ-129 fire control radar, and theoretically capable of firing the AGM-45 Shrike anti-radiation missile, although they were apparently not used in that role. The navigational radar is AN/APN-153. Only 28 EA-6As were built (two prototypes, 15 new-build, and 11 conversions from A-6As), serving with Marine Corps squadrons in Vietnam. It was phased out of front-line service in the mid-1970s, remaining in use in reserve units with the USMC and then the United States Navy primarily for training purposes. The last had been retired completely by 1993. 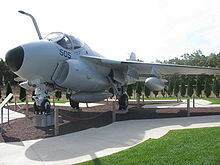 A much more highly specialized derivative of the Intruder was the EA-6B Prowler, a "stretched" airframe with two additional systems operators, and more comprehensive systems for the electronic warfare and SEAD roles. An derivative of AN/APQ-156, AN/APS-130 was intalled as the main radar for EA-6B, and the navigational radar is upgraded to AN/APS-133 from the AN/APN-153 on EA-6A. In total, 170 were produced. The Prowler remains in service as of 2009, replacing the Air Force EF-111 Raven when the DOD decided to let the Navy handle all electronic warfare missions. It is to be replaced by the EA-18G Growler Super Hornet variant. YEA-6A One YA-6A aircraft was converted into the EA-6A prototype. YEA-6B The designation of two EA-6B prototypes, which were modified for special test purposes. NEA-6A One EA-6A aircraft was modified for special test purposes. Picture - A Grumman A-6 Intruder on display at Grumman Memorial Park. The A-6 Intruder was featured in a 1986 novel by Stephen Coonts called Flight of the Intruder , with a plot line somewhat similar to the book Thud Ridge about pilots flying into Hanoi restricted by militarily dubious rules of engagement. In 1991, Flight of the Intruder was adapted as movie, and followed by the novel's 1995 sequel, The Intruders. Jenkins, Dennis R. Grumman A-6 Intruder - WarbirdTech Volume 33. North Branch, Minnesota: Specialty Press, 2002. 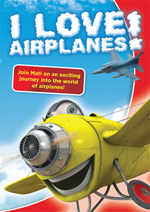 ISBN 1-58007-050-7. Miska, Kurt H. "Grumman A-6A/E Intruder; EA-6A; EA-6B Prowler (Aircraft in Profile number 252)". 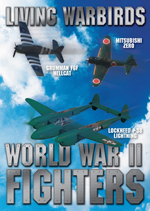 Aircraft in Profile, Volume 14. Windsor, Berkshire, UK: Profile Publications Ltd., 1974, pp. 137-160. ISBN 0-85383-023-1. Morgan, Mark and Rick Morgan. Intruder: The Operational History of Grumman's A-6. Atglen, PA: Schiffer Publishing, Ltd., 2004. 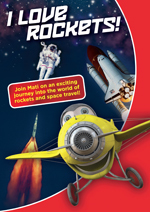 ISBN 0-7643-2100-5. Grumman A-6 Intruder Pictures and Grumman A-6 Intruder for Sale.